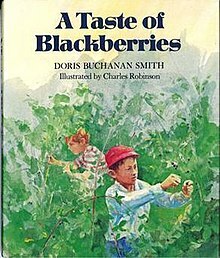 A Taste of Blackberries (HarperCollins, 1973) is an award-winning children's book by Doris Buchanan Smith (June 1, 1934 - August 8, 2002). When Doris Smith set out to find a publisher for A Taste of Blackberries, what she found instead was rejection. Children's editors believed the story was better suited to adults than to children. It fact it was the book's theme and style which set it apart from other children's books at the time. If death had been a common theme in books for children, think Oliver Twist, it had long since become taboo, until E. B. White introduced the theme to young readers in his classic Charlotte's Web, in 1952. For many years Charlotte's Web was the accepted template for addressing mortality in children's books. Then Smith's story appeared, a story in which animals do not stand-in for humans. In the 1970s, literary realism had taken hold, and Smith was at the vanguard of the movement, acquainting young readers with "the darker, harsher side of life." According to author and blogger Pauline Dewan; "Many writers believe that authors do not help children by sheltering them from the problems of the real world." Indeed, many young readers told the author "they liked it because it was sad." Interviewed for the Dictionary of Literary Biography, Smith recalled that A Taste of Blackberries was supposed have been an adventure story, but an unexpected thought popped into her head while writing it. So upset was she with this idea that she put the story aside. Smith resumed her work by focusing on the different ways that children and adults responded to mortality, and wrote from the point of view of the young narrator, and the story was completed. Rejected by as many as three publishers, A Taste of Blackberries was accepted by Thomas Y. Crowell Co., now HarperCollins, and released to wide acclaim in May, 1973. "Smith deals honestly and emphatically with the range of emotions," wrote Cynthia Westway in The Atlanta Journal, "the story is not, however, an elegy; but a celebration of the continuity of the life-death cycle." In the Times Literary Supplement, David Rees wrote, "It will be difficult to find a children's book this autumn by a new author as good as Doris Buchanan Smith's A Taste of Blackberries . . . Smith's success lies in knowing how to handle the theme with exactly the right balance of sensitivity, humour and open emotion." As told from the point of view of the unnamed narrator, the story begins as he and his best friend Jamie go blackberry picking. We follow the boys as they take part in a series of exploits - some told in current narrative time, some revealed in poignant flashbacks - allowing the reader to witness their world and shared experience. When one of the boys tragically dies as a result of an allergic reaction to bee stings, the narrator struggles to cope with denial, grief, guilt, and loneliness, before coming to terms with the loss. The story is set in a suburb of Washington, D.C., the author's birthplace. Jamie is a "show-off and a clown". While he can be exasperating, his adventurous and resourceful nature earns the admiration of his best friend. The narrator, Jamie's appreciative audience and partner in fun, enjoys their friendship, even if, at times, Jamie can go too far. Heather, with red-gold hair, is the closest friend of both Jamie and the narrator. Jamie's mother cares for a family of three, including Jamie, four-year-old Martha, and an infant son. The narrator's mother and father care for the narrator and a college-age daughter who is away at summer camp as a counselor. They also have a son who is grown and married. Mrs. Houser, Jamie's next door neighbor, is tyrannical when it comes to her perfect lawn. The children in the neighborhood avoid her, and her lawn, if they possibly can. Mrs. Mullins' "secret garden" is off limits to most of the children in the neighborhood. The narrator feels privileged to be an exception, mainly because Mrs. Mullins and his mother are friends. "In dealing directly with the death of a child's playmate, it broke a taboo of twentieth-century American children's fiction," wrote Hugh T. Keenan, in the St. James Guide to Young Adult Writers. British author, lecturer and reviewer David Rees drew parallels between Charlotte's Web and A Taste of Blackberries in The Marble in the Water: Essays on Contemporary Writers of Fiction for Children and Young Adults (1980). He writes that "in A Taste of Blackberries we do have a story for young children in which death - sudden and inexplicable - is the main theme, and it is a book in which the characters are not talking animals." "The chief purpose of the book," Rees argues, "is to write about death in a fashion that young readers can take, and in this Doris Buchanan Smith succeeds admirably." "These two authors are saying things that are necessary, and which help children to cope and to grow." A Taste of Blackberries is "one of the seminal children's books on the subject of death." Smith won the Josette Frank Award, for "outstanding literary merit in which children or young people deal in a positive and realistic way with difficulties in their world and grow emotionally and morally," The author also won the Georgia Children's Book Award, the Children's Best Book Prize in the Netherlands (Zilveren Griffel), and was named Georgia Author of the Year, all for A Taste of Blackberries. In addition to 19 English language editions, the book has been translated into Dutch, Danish, French, Spanish and Japanese. A Taste of Blackberries was nominated for the prestigious Newbery Medal in 1974, and is an ALA Notable Children's Book. "It blazed the way for the many other grief books that quickly followed, but few have approached the place of honor this one holds," wrote Jim Trelease in The Read-Aloud Handbook (Penguin Books, 2006). ^ Derrick, Henry (14 August 2002). "Obituaries: Hayesville, NC: Doris Buchanan Smith, 68, Wrote for Adolescents". Atlanta Journal-Constitution. pp. P.C6. Retrieved 19 April 2011. ^ "Doris Buchanan Smith". St. James Guide to Young Adult Writers. Gale Biography In Context. Retrieved 29 April 2011. ^ Scherer, Sally (18 April 1996). "Author of Children's Books Found Success by Breaking Rules". The Macon Telegraph. ^ Lois Rauch Gibson; Laura M. Zaidman (Winter 1991). "Death in Children's Literature: Taboo or Not Taboo?". Children's Literature Association Quarterly. 16 (4): 232–234. doi:10.1353/chq.0.0855. Retrieved 30 August 2012. ^ Habich, John (December 1980). "She tells kids the bitter and the sweet". Tallahassee Democrat. ^ Dewan, Pauline. "Children's Literary Classics: The Realistic Genre". Retrieved 29 October 2012. ^ Davis, Jingle (December 10, 1978). "A Realist in Children's Books". The Atlanta Journal. ^ Keenan, Hugh T. (1981). "Doris Buchanan Smith". Dictionary of Literary Biography. 52: 353. ^ Westway, Cynthia (August 5, 1973). "How a Child Responds to Facts of Death". The Atlanta Journal. ^ Rees, David (September 19, 1975). "The most difficult problem". Times Literary Supplement. ^ Rees, David (1980). The Marble in the Water: E. B. White and Doris Buchanan Smith. The Horn Book. pp. 66–77. ISBN 0-87675-281-4. ^ Welton, Ann (December 2002). "Buchanan Smith, Doris Un sabor a moras (A Taste of Blackberries)". School Library Journal. 48 (12): p.S60. Retrieved 20 April 2011. ^ "Georgia Children's Book Award". College of Education at the University of Georgia. Retrieved 11 March 2014. ^ "Doris Buchanan Smith". Major Authors and Illustrators for Children and Young Adults. Gale Biography In Context. Retrieved 24 April 2011.